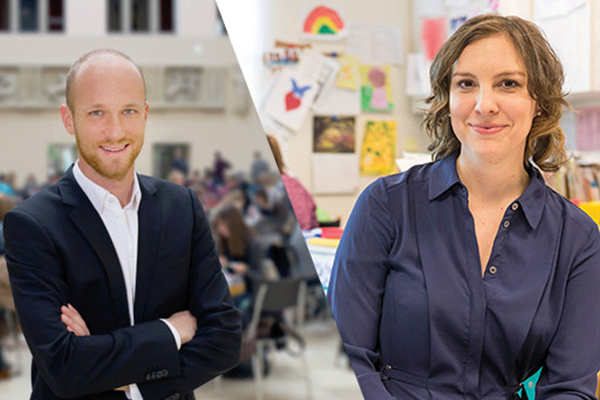 School of Education and Social Policy faculty members Terri Sabol and Hannes Schwandt are among six new fellows joining Northwestern University’s Institute for Policy Research. Sabol, a developmental psychologist, studies pressing social policy issues that affect low-income children and families. Schwandt is an economist who focuses on health and economic inequality. “Our new colleagues are working on exciting, innovative research in diverse areas with clear policy impact, and we look forward to collaborating with them,” said IPR director and economist Diane Whitmore Schanzenbach, the Margaret Walker Alexander Professor of Human Development and Social Policy. Read more about the new fellows and their research below. Sabol’s research looks at how to effectively invest in early childhood education to reduce disparities for young, poor children. As director of the Development, Early Education, and Policy (DEEP) lab, Sabol specifically studies how early childhood education centers engage and support families. She also examines how professional development programs improve early childhood classroom quality and child learning outcomes. In 2017, Sabol was named an early career fellow by the American Educational Research Association and the Society for Research on Child Development. She has been published in Child Development, Developmental Psychology, Science, and the Journal of Policy Analysis and Management. Before receiving her PhD from the University of Virginia, Sabol was a first-grade teacher in Chicago through the Teach for America program. One branch of Schwandt’s research studies societal shocks – including stock market fluctuations, unemployment, trade volatility, and the spread of disease – and their impact on health, human capital, and fertility. He has examined seasonal influenza, or the flu, which causes strong inflammatory responses in pregnant women. Using Danish data, he found maternal influenza leads to a doubling of prematurity and low birth weight in newborns; in utero exposure also affected their job prospects as adults. His research has been published in journals such as Science, Proceedings of the National Academy of Sciences, and the Harvard Business Review. He joins IPR as an assistant professor in SESP from the University of Zurich. Schwandt received his PhD from Universitat Pompeu Fabra in Spain in 2012. He is on leave for 2018–19 at Stanford University.